Nitin was a senior site supervisor at a major construction firm in Mumbai. As the day shift was petering to a close towards the late afternoon, the skies clouded over- ominously dark grey as a typical monsoon sky would be. Looking at his watch he reassured himself that it was just about half an hour for the shift to end and head home. As he glanced anxiously again skywards, Nitin was stunned by what he saw! The sun, which would have been a blazing, fiery yellow otherwise, was a silver ghost. The thick cloud cover had robbed it of it's brilliance and it appeared very much like a full moon would. What's more, the sun had started creeping towards the construction site and..and..was snugly poised right atop the huge hoist crane! There it was on the huge construction site's unfinished top floor. Everyone simply mesmerised by the spectacle, trying to believe all this was for real. 'Out you go, all of you! Not a word to anybody about this.' thundered Nitin to his men who were still dumbstruck. His luminous watch dial now showed it was almost six in the morning. The clouds had given way to a dark blue early morning sky. Slowly at first, then gaining momentum the sun began shining to it's full glory. His joy turned to horror as the huge ball of fire's extreme heat vapourised him in a few seconds. Well, this story is a metaphor for my own experiences. Success itself is difficult to define and is a subjective term. I am referring here to my successful battle with Bipolar Disorder over the decade. Had been through the horrors and developed my own methods of keeping my mind calm and focused. It needed a friend to notice that my abilities and resolve in tackling this disabling illness and leading what could be defined as the closest to a 'normal' life (if that means anything) were commendable. Puneet Bhatnagar, who has also mentored my writing initiatives when I was new to this skill, drilled into me that the gift I possessed needed to reach the far flung corners of this country and beyond. We Indians have hardly done ourselves proud in the area of awareness, diagnosis, consultancy and treatment of mental illnesses. Although my journey is in its infancy the disquieting fact is that not a single Bipolar whose relative spoke to me describing the agony they faced, was reported Bipolar in a stable condition. This Blog has some posts detailing my tryst with Bipolar. Puneet, however felt (and rightly so) that a focused site was the need for the hour. Thus was born bipolarindia.com If I have a God given gift, it had to be utilised optimally for the benefit of the society.Am overwhelmed by the gratifying response to it in the short period since launch! 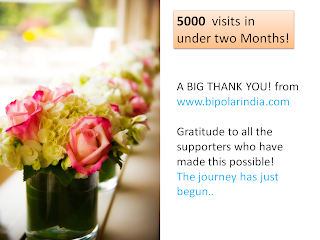 What is even more satisfying is the interaction, queries and cases of Bipolar patients that have come to light. Am getting a sense that gradually the purpose the site was set up for is being achieved. 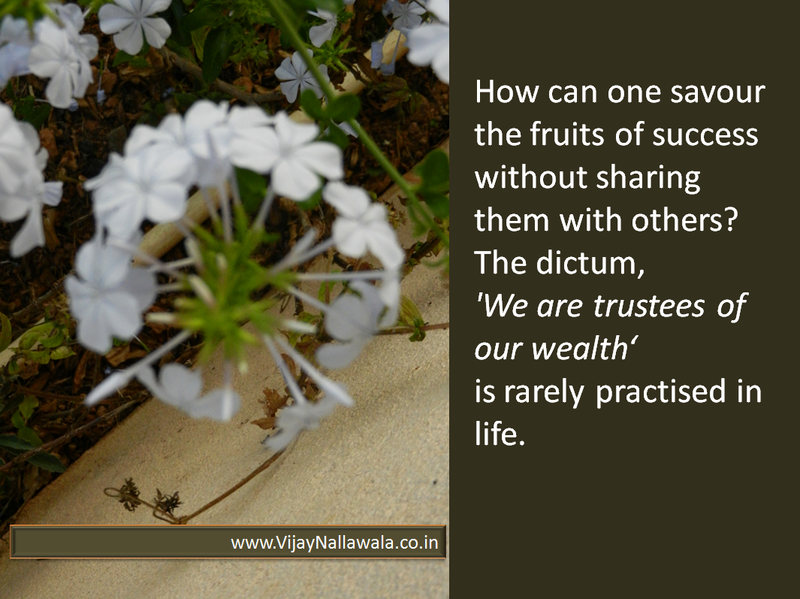 The fulfilment it has ushered in is difficult to describe. My positive energy and my sense of purpose, increased manifold when I shared my light with the world. Holding it close to my chest would have burnt me, too.